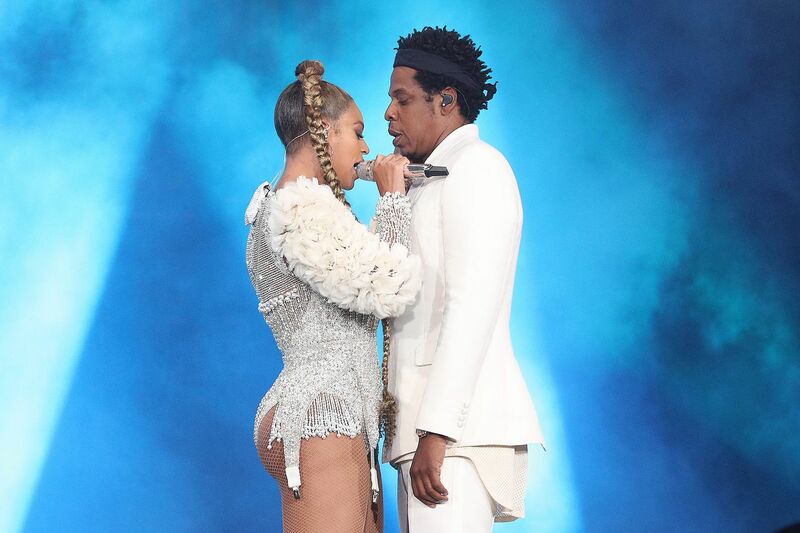 Since the most formidable couple in music last toured together in 2014, Beyoncé and Jay-Z have made a great success of taking their private life public. The contentious conversation started with the she-said portion of cheating accusations on her masterwork Lemonade in 2016. His contrite he-said reply followed with last year's top-shelf 4:44. And this year, the duo united as the Carters with a we-said resolution party album, Everything Is Love. So it was as a joint unit that the two superstars brought their On the Run II tour to Lincoln Financial Field on Monday night for an action-packed two-and-a-half-hour show that framed their solo careers in the context of their romantic relationship and that worked hard to turn family drama into stadium-size summer entertainment. It was a show with a lot to accomplish, tasked with giving equal time to the bodies of work of two constant hitmakers, and special attention to the moments when their careers have naturally intersected. One way in which the two-stars-are-better-than-one approach was an unquestionable improvement over their recorded output was apparent at the start. After a home-movie introduction accompanied by a recording of Nina Simone's "Black Is the Color of My True Love's Hair," the duo appeared holding hands, dressed in glittering white, appearing tiny in comparison to the giant versions of themselves that loomed on the video screens behind them. Their opening duet was on "Holy Grail," the single from Jay-Z's 2013 album Magna Carta Holy Grail, whose hook was originally sung by Justin Timberlake, who toured stadiums with the rapper that year. Let's just say Beyoncé made for a more comfortable fit singing love-song lyrics to her street-smart hubby than JT did. That pattern was continued throughout the evening, as she also upgraded the vocals on the sticky-sweet encore "Forever Young," which is not the Bob Dylan song. The audience was at least 80 percent female, a proportion that might lead one to believe the crowd belonged to Beyoncé alone. It wasn't that simple, though. There's no question Queen Bey rules — and she was vocally, aerobically, and fashionably impressive all evening, as she mixed and matched a number of skin-tight outfits with a lengthy topknot ponytail that she whipped around dramatically, like Roger Daltrey twirling his microphone cord. Beyoncé during the “On the Run II” tour at Lincoln Financial Field on Monday. Yes, the Bey Hive went bonkers when their charismatic commander-in-chief led a phalanx of dancers on militaristic drum corps marches with racially proud, feminist messaging like "Formation" and "Run the World (Girls)" performed on an auxiliary stage that lifted off from the main one and slowly made its way to the middle of the football field. As well they should have — they were dazzling set pieces. The crowd also went for newer songs like "Family Feud," which encapsulated the Carter family wealth-accruing philosophy: "What's better than one billionaire? Two." And it included "The Story of O.J.," the 4:44 disquisition on race and celebrity in America, which was accompanied by powerfully unsettling black-and-white cartoons showing racist caricatures and which ended with a black power salute in a stadium full of raised fists. The On the Run II tour is an entity unto itself. There was in-between-song chatter about the unifying power of love, and a Philly-specific mention of the recent brouhaha that threatened to move Jay-Z's Made in America festival, whose seventh-annual edition happens on Labor Day weekend, off the Ben Franklin Parkway. The rapper and entertainment mogul also did not take the opportunity to hype Rest in Power, the Trayvon Martin documentary series he produced that was premiering on the Paramount Network and BET as Monday's show was happening. The show was fast-paced, cramming in more than 40 songs played at least in part, plus several filmed interludes showing the couple either at odds or kissing and making up in some glorious-looking island retreat. The midsection was fabulously entertaining, but at times it felt overly episodic, as each star would take turns doing two or three songs alone, then one together, then costume change and repeat. The duo were backed by a large, horn-heavy band that mixed members of the all-female ensemble that's backed Beyoncé on her recent tours with members of her husband's touring unit. The musicians were situated within Hollywood Squares-like cubes in the middle of the four-level towering stage, with super-hi-def video screens on either side of them. In addition to the moving stage that brought the stars closer to the people, there were two runways for Bey and Jay to walk to get out among the crowd. In terms of state-of-the-art stadium production values, OTR II ranks right up there with Taylor's Swift's recent Reputation tour when it comes to sparing no expense in putting on an eye-popping show. Before the start of the show, the phrase "This is real life" was emblazoned in bold on the big screen. Is it? Perhaps. Who knows what the true ins and outs of the Beyoncé and Jay-Z relationship are? But whether it's real life or a constructed narrative, her performances in particular come across with the power of conviction. That was true not only in delightfully entertaining vamps like "Baby Boy" and fighting-words songs like "Don't Hurt Yourself," which ripped and roared with guitar riffs borrowed from Led Zeppelin's "Kashmir." But she also went for tender-but-still-ticked-off ballads such as "Resentment," from 2006's B'day, with her in the middle of the stadium in a saffron dress that looked like it could have been designed by Christo, singing the line "and it's all because you lied" like she really, really meant it. The show's narrative tells us that, after all that drama, love and commitment have conquered all for our fabulously wealthy and talented heroes. By the time the show closed with the corny "Forever Young" and the legitimately banging "Apes-" (weirdly, one of only two songs performed from Everything Is Love), Beyoncé in particular looked blissed-out as the open-air room was suffused with the vibe of conjugal bliss. But despite its happily-ever-after ending, OTR II still maintains an edge in its implicit she-to-he message: "Don't even think of trying it again, mister."